The Tamir Rice grand jury decision shows that we give police too wide a berth. Tamir Rice’s death is what happens when we don’t require police to accept risk. 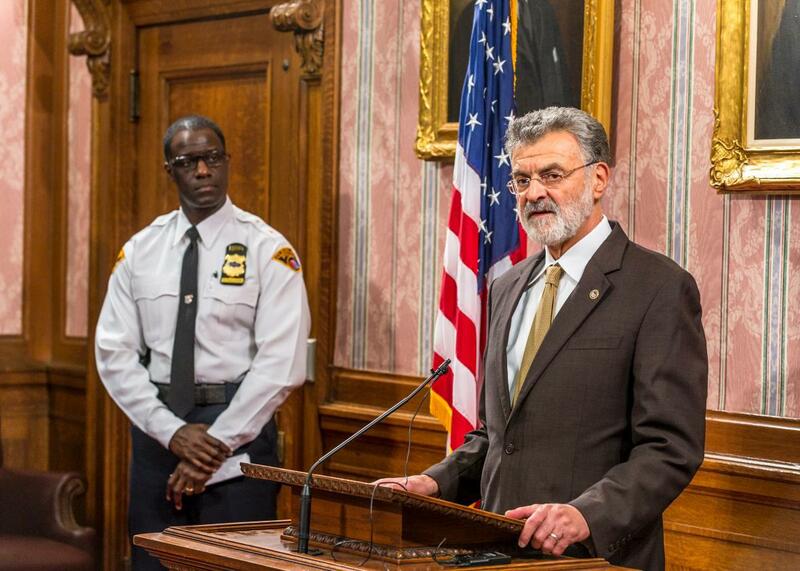 Cleveland Mayor Frank Jackson speaks to reporters on Dec. 28, 2015, after a grand jury declined to bring charges against either of the two police officers involved in the fatal November 2014 shooting of Tamir Rice. Photo by Angelo Merendino/Getty Images. A Cleveland grand jury has declined to bring criminal charges against Timothy Loehmann and Frank Garmback, the police officers who killed 12-year-old Tamir Rice after mistaking his gun replica for a real weapon. In a statement after the November 2014 shooting, police said, “The suspect did not comply with officers’ orders and reached to his waistband for the gun.” Video puts doubt on that claim. In the infamous surveillance video of the shooting, Garmback arrives on the scene driving a police cruiser. As the car arrives, Loehmann exits the vehicle and shoots, fatally wounding Rice. The whole event took seconds, and, with no audio, there’s no indication the officers warned Rice or gave him a chance to respond. For the past two years, I’ve written about police shootings of black Americans, from Jonathan Ferrell in North Carolina and John Crawford in Ohio to Michael Brown in Missouri, Walter Scott in South Carolina. * Each time, I try to pinpoint something in the encounter that illustrates a broad trend. With Tamir Rice, there’s almost too much to account for. From faulty, racialized perceptions of age and maturity (according to one study, police overestimate the age of black children by more than four years and perceive them as less “innocent”) to the rapid, lethal use of force, the Rice shooting is almost textbook in how it conforms to research on race and perception. Which is to say that, on those issues, I don’t have anything new to add. But there are other questions, raised by the prosecutor’s statement, that are worth tackling. What’s pressing about the Rice case isn’t what it says about racial prejudice and implicit bias—lessons we’ve already learned from too many other killings—but what it says about the police themselves. Strip away the rhetoric, and McGinty has made a clear statement about police conduct: If police perceive a threat to their lives then they’ve de facto justified their actions regardless of context, even if it ends with taking the life of a child. That includes situations like the Rice shooting, where police chose to create a confrontation, rather than manage an encounter. More broadly, police are empowered to take control of all situations by any means necessary, even those that aren’t criminal. They have no obligation to survey a situation to seek the least violent resolution. Taken together, these prerogatives—established time and again, by departments across the country—encourage police to use lethal force as the first resort. It’s tempting to see this with sympathy. Police, after all, are just ordinary people. They want to go home to their friends, partners, and children. Blue lives matter, goes the mantra, police have a right to go home safely. This is true, but only to an extent. Part of policing is risk. Not just the inevitable risk of the unknown, but voluntary risk. We ask police to “serve and protect” the broad public, which—at times—means accepting risk when necessary to defuse dangerous situations and protect lives, innocent or otherwise. It’s why we give them weapons and the authority to use them; why we compensate them with decent salaries and generous pensions; why we hold them in high esteem and why we give them wide berth in procedure and practice. Given this status quo, Tamir Rice—his shooting and the officers’ acquittal—is inevitable. Indeed, it’s almost certain to happen again, since the system isn’t equipped to push back on these new norms of policing and the extraordinary benefit of the doubt that police receive. Just this weekend, Chicago police—called to deal with a domestic disturbance stemming from mental health problems—killed a 19-year-old student and a 55-year-old mother of five within minutes of arriving on scene. One last point: Changing this is in the best interest of police officers. Yes, abandoning “safety at all costs” means accepting additional risk. But it also means an emphasis on de-escalation in policing, which—in communities that need good policing—engenders more trust for police departments. With more trust comes more community cooperation and more resources for solving crime. The same is true for more and greater accountability. In the long run, both create safer environments for citizens and police. Which, I hope, is what we all want.